I really like girl power in movies, and I certainly don't mind seeing female-led movies. Some of my favorite movie heroes are Sarah Connor and Trinity and Ellen Ripley and The Bride. I don't mind remakes of movies about women. With all of this said, it comes off as nothing more than a politically correct publicity stunt now that we are living in a all-women craze. Let's remake every successful movie but with all women! It's a nice thought, but it's a dead-end creatively and a perfect reminder that there are several people out there who misunderstand what this is all about. A few years ago, there were many screaming for Charlize Theron to play a female James Bond, when James Bond being a womanizer has always been part of his character. Were they planning on making this female James Bond a lesbian? If not, then simply calling a female spy James Bond isn't James Bond, it would be something else, so why not just embrace that something else? I would rather see an entire series of "Atomic Blonde," another spy movie starring Theron, then having her play a female James Bond simply because the Social Justice Warrior populace is asking for it. That was my biggest problem with the female-led "Ghostbusters" a few years ago. It had absolutely nothing new, exciting or innovative to offer. It was a publicity stunt for the sake of it, a shameless way to make a few extra bucks off of a franchise that should have been left alone. Sadly, its tough to really discuss this, since even remotely suggesting it means I am anti-women, and that's just sad all around. You are responsible for the art you create and once you've created something it belongs to the audience. If the audience denounces it, then that's that, it doesn't mean that everyone is anti-feminism. The female-led "Ghostbusters" movie was not funny, despite all the good talent involved, it referred to the old movies simply for referring to them, the special effects were good if the year was 1995 and it just felt like more of the same instead of doing something fun with the universe. I still can't fathom why these "remakes with all women" are still on the rise, and I was prepared to not give two shits about "Ocean's 8." Much like the original "Ocean's 11," its filled with great talent, like Sandra Bullock, Cate Blanchett, Anne Hathaway, Rhianna, Mindy Kaling, Helena Boneham Carter and even Richard Armitage. 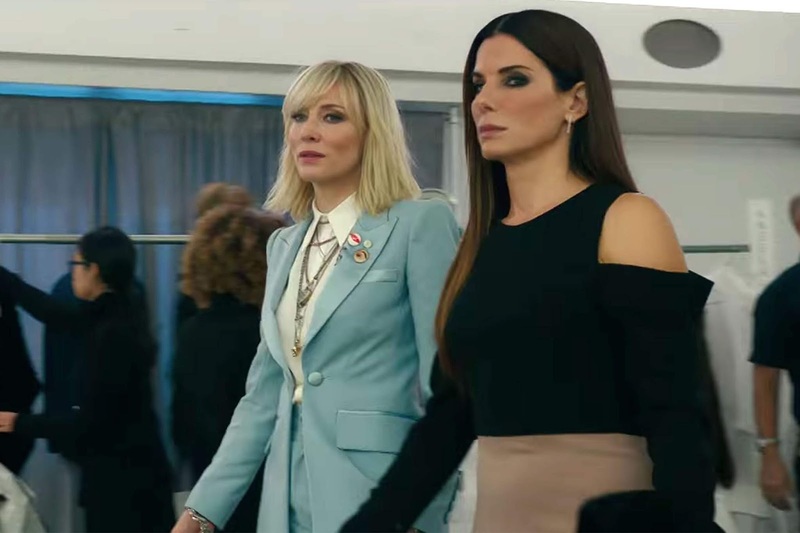 Sandra Bullock is Debbie Ocean, a mastermind who recruits a group of all-women criminals for a big heist. It already sounded like more of the same but with a PC twist, and that sounded like a waste of time. "Ocean's 8" begins like the original did too, with a camera facing a distraught Debbie Ocean, in jail garb. The camera stays on her the whole time during a conversation about parole, you never see who she's talking to. This entire technique was used in the first film and its so shamelessly pulled from the original that I thought I was going to see a repeat of 2016's "Ghostbusters," a mere remake of a great movie with nothing but a political stunt being the only worth to see it. I was ready to hate it, I was ready to have so much of my time wasted. George Clooney's movies were all about criminals who were smart, cool and hip. Those movies were clever and slick. I wouldn't call "Oceans 8" clever or slick, but that doesn't mean that it tries hard to please. This is a movie about smart movie, but it has its own identity, it has its own feel and I applaud that the movie has its own beating heart, instead of merely trying to be what Clooney's movie was back in 2001. There is still plenty of fun to be had here, and its beating with a pulse of its own heart. That I can appreciate quite a bit. I thought that it was a little disappointing that Sandra's character and Richard's character were once dating, and this whole plan just boils down to a revenge heist. That simply just copies too much on what was done before and I wished for a little more imagination when coming up with a reason to assemble all of these criminals. I also found it to be a bit cheesy that all the pop songs that appear in the movie are songs about women. It seems just a little cliche and a little too on-the-nose to be taken seriously. But perhaps that's the point the filmmakers were trying to make, trying to make something that was one-the-nose. The thing is, the movie already mostly works as just a caper film. Something fun and fresh, you don't need all that cliche stuff to remind the audience that you're making an all women movie. Just leave it how it is. I know "Oceans 8" is continuation of a popular franchise, but it truly doesn't feel like any other movies out right now. I am glad that I was pleasantly surprised by this. I don't completely love it, but I found "Oceans 8" to be mostly enjoyable. In a blooming summer season, you probably will too.